Visit Bath & Body Works through Shop At Home. Click the blue “Shop Now” button to get started. A new Bath & Body Works window will open. ‘View Bag & Checkout’ to proceed to checkout. Login to your account or enter your billing info. Proceed to payment processing and enter promo code RMNMAR13 to save 20% on your order. Submit order and enjoy your 3% cash back! “Like” Bath & Body Works on Facebook to grab this Bath & Body Works $10 off your $30 purchase printable coupon before you head to Bath & Body Works. This offer is valid in store through 2/3. 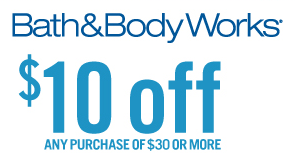 Grab this Bath & Body Works $10 off your $30 purchase printable coupon before you head to Bath & Body Works. This offer is valid in store or online through 11/18. Just use promo code TEN50 (shipping charges will apply) during your online checkout. Visit Bath & Body Works this weekend and get a FREE Signature Item (up to $12) with your $10 purchase. This offer is valid in store or online through 9/4. Just use promo code AMOUR12 (shipping charges will apply) during your online checkout, or print your coupon to use in stores. Stop in on Saturday, 8/11 from 1 to 5pm during their Welcome to Paris Party and you’ll also get an exclusive gift with any full-size Signature Item purchase.